Robin Hood and Company was begun in the Toronto Telegram on September 23, 1935 and carried on until December 16, 1939. The author and copyright-holder was Edwin R. “Ted” McCall (1901-1975) who had previously created Men of the Mounted, (February 13,1933-February 16, 1935,) the first comic strip ever to feature Mountie heroes. Men of the Mounted was drawn by staff cartoonist H. S. Hall. McCall later marketed the hero as a Big Little Book. King of the Royal Mounted wasn’t to appear until 1936, first in Feature Comics No. 1, then in his own newspaper strip. 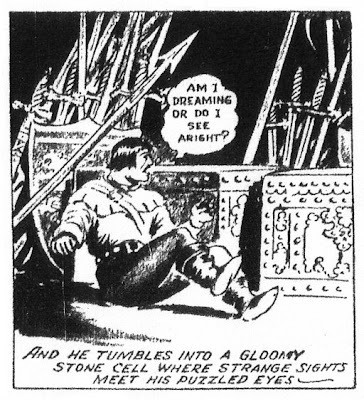 Charles R. Snelgrove, a staff artist who illustrated newspaper serials, drew Robin Hood as a beefy, beetle-browed, bull-necked muscleman with a Prince Valiant haircut. Whether Hal Foster was familiar with the strip is unknown but it is not unlikely he may have come across the comic in the Toronto Telegram or some other Canadian newspaper. After a faltering start Snelgrove became more accomplished at his work. He experimented with crayon and stippling to good effect. Robin Hood was reprinted in 1938 in the Sparkler, (1934-1939) a weekly Amalgamated Press comic from Britain. Sparkler was printed with a colour cover with black and red interior pages. Some of the British newspaper artists worked here including Jack Greenall and (gasp !) Ray Bailey, artist on the Space Cadet strip. Bailey worked on Len and Yen (1935), Monty the Merry Mischief, Hopeful Horace, and the Chimps (all in 1937). In March 1941 Toronto based Anglo-American published Robin Hood and Company, a tabloid -sized reprint of the Toronto Telegram strip. Better Comics, from war-time Vancouver, B.C. publishing company Maple Leaf, hit the newsstands at the same time. It consisted of entirely original material and is considered Canada’s first comic book. Mordecai Richler described the Canadian “whites” (colour cover, b&w insides) as “simply awful.” He claimed the absence of American four-colour comics, restricted by government for economic reasons, led to a street corner black market in Detective and Action comics. Author Harlan Ellison had a differing view on their qualities and today the Canadian “whites” are among the rarest comic books in the world. When I was young Canadian “whites” were still plentiful but kids trading comics usually treated them with disdain for their lack of colour. 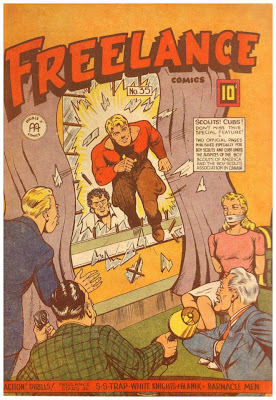 McCall brought his two comic strip properties to Anglo-American, where he worked with cartoonist Ed Furness on Freelance, Commander Steel, and Red Rover. Anglo-American also acquired scripts from Fawcett Publications and produced B&W Canadian versions of Commando Yank, Captain Marvel and Senorita Rio. Labels: McCall Ted, Robin Hood and Company, Snelgrove Charles R.